The week before last we took little man to the park. We walk past it every time we go to & from baby clinic/stay & play, but have never stopped before, but now he is obviously more alert & aware, we thought we would pop in and see what he thought to it. It is a fairly new park, with a variety for younger and older children. Obviously he is limited at the minute to what he can play on, but we managed the baby swings, the bouncy fire engine, the slide, a see saw type thing, and a thing that spins round (I don’t know the proper name!). He absolutely loves the swings! He had a huge grin, and he giggles as you push him, it’s just so cute to watch, and I actually got a bit emotional as this is one of the things you long to do as a family! I have vowed to take him at least once a week.When he gets his birthday present (a smart trike) he can go on that as it’s only a 5 minute walk. 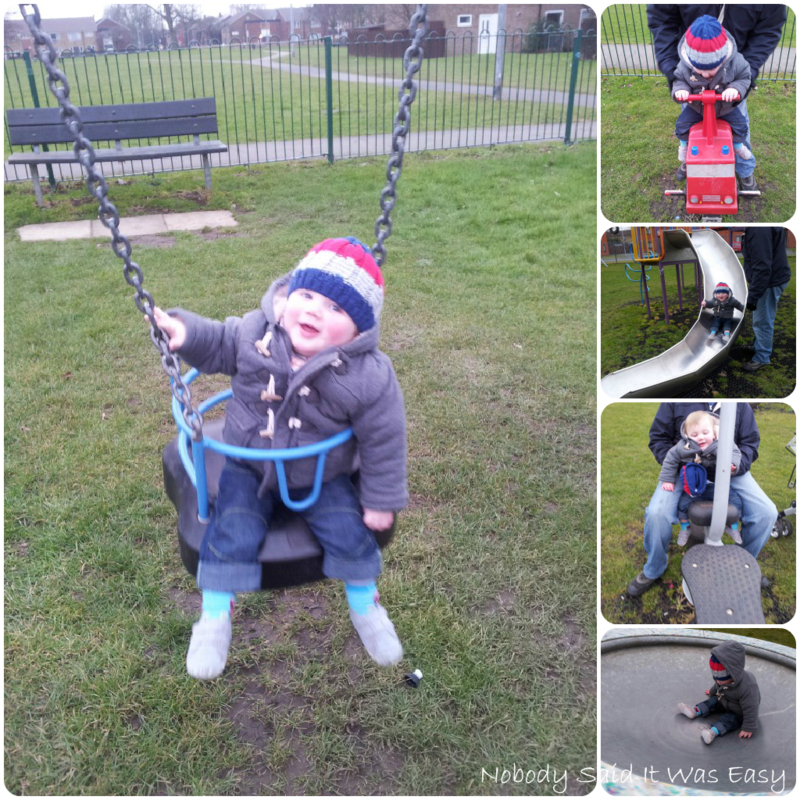 As he loved the baby swing, the second time we put him on a larger round swing which swings round in circles and he was holding on, and I’m sure he wanted to go faster – I think he’s going to be a bit of a thrill seeker!